EVER MY LOVE: The Lore of the Lucius Ring is LIVE!!! For a limited time, you can get the entire collection for only 99 cents! I love release day!! EVER MY LOVE: The Lore of the Lucius Ring is now LIVE!! This one has been a year in the making. It is the much anticipated sequel to last year’s USA TODAY Bestselling book, With Dreams Only Of You. I am so excited about the wonderful stories in this anthology. These are all brand new stories from me, Kathryn Le Veque, Sabrina York, Eliza Knight, Cheryl Bolen and Susan Stoker. 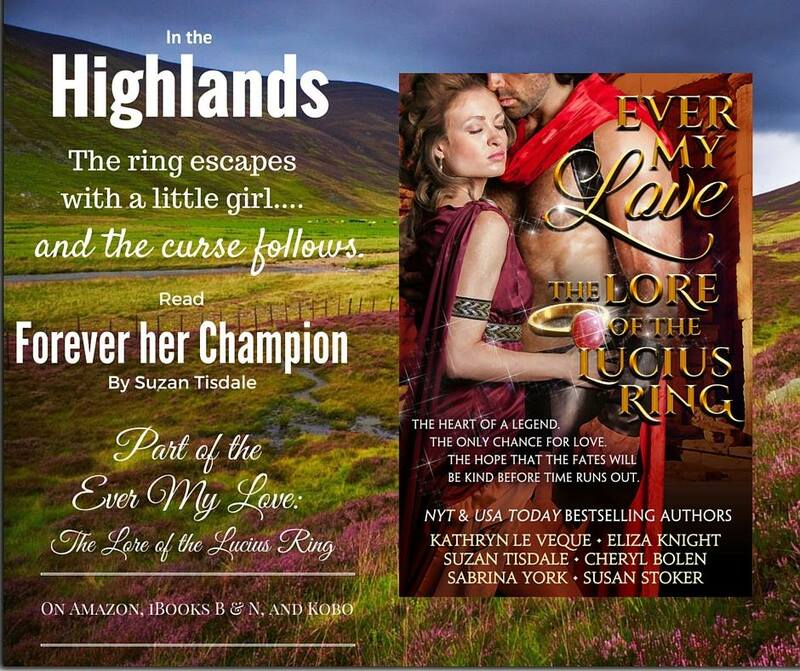 My contribution — Forever Her Champion — is set in Scotland in the late 15th century. The heart of a legend. The only chance for love. The hope that the Fates will be kind before time runs out. The long-awaited sequel to the original multi-genre USA TODAY bestselling collection, With Dreams Only Of You: The Legend of the Theodosia Sword, has finally arrived. Welcome to EVER MY LOVE: THE LORE OF THE LUCIUS RING, a multi-genre new material collection unlike any other romance collection available today. In ancient Rome – The ring, and its curse, begin with the beautiful Theodosia. Medieval England – The ring finds its way into a notorious outlaw’s possession only to curse the woman he loves. The Scottish Highlands – The ring escapes with a little girl… and the curse follows. Tudor England – The ring once again becomes the prize for the lawless when an infamous female pirate tries to steal it from a Queen’s Naval Captain. Georgian Era – Twin sisters vie for the ring – and for the Duke of Axminster. Regency England – The ring enters the proud and proper Regency set where the curse finds new life. Modern Times – Mistaken identity, soul mates, and the last chance for the ring to fulfill its destiny. Seven unique and powerful brand-new stories take the legend of the Lucius Ring through the ages. Discover how each woman finds her own love, peace, and happiness. The ring that can tear them apart is also the one that binds them. The heart of a legend. The only hope for love… will each lady find her destiny before time runs out? At: iBooks, Amazon, Nook, and Kobo. For a limited time, you can get the entire collection for only 99 cents! Previous PostWRITERS ON THE RIVER! !Next Post150 Authors, $2500 in Prizes!